This week's Reward Challenge is the impetus for the majority of the episode's drama. But who wouldn't get overly emotional for the world's largest jars of peanut butter and jelly? The drama itself surrounds new Mana, who lose the challenge after Debbie blows their lead on the balance beam.But then it all pops off when Debbie says Brad dictates everything and made her do the beam, except at the challenge she said she was good at balancing and Brad agreed she should do it. Debbie thinks she's on the outs of the tribe and being replaced by Hali, who she says messed up the balance beam first. 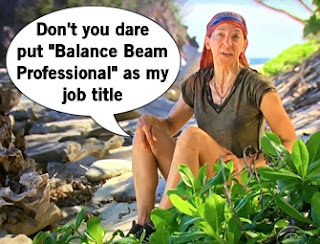 Debbie does some push-ups to workout her rage and then passively aggressively comments about her balance skills and challenge talent throughout the Immunity Challenge. Oh and Tai finds another idol clue because he's an idol magnet. The Vanua tribe is smooth sailing as they continue to dominate challenges and indulge in PB&J. But the game is always happening and Sarah is bored by obvious alliances, approaching Troyzan to work together. Nuku is reeling over the loss of Malcolm because of JT's epic Tribal Council blunder. 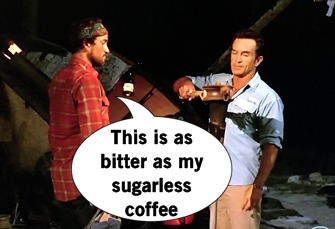 JT's ecstatic when he finds a Hidden Immunity Idol, but returns to a pissed off status when Michaela requests an insane coffee order that's basically a spoonful of sugar. Seeing an opportunity to create chaos between JT and Michaela, Sandra downs all the rest of the sugar and I can't believe she didn't pass out face down in the sand from the sugar. 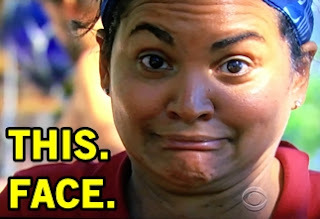 This rivalry is perfectly setup and when Mana loses the Immunity Challenge, the tribe is split. Sugarnapping is a serious offense on Survivor, but revenge for Malcolm is on the top of Sandra's mind. It's Varner in the middle deciding between a more peaceful camp or taking out a threat. Tribal Council time! Sandra explains the tribe felt JT betrayed the tribe or someone snitched in order for Tai to play the idol properly. Michaela calls out JT straight up saying he thinks he runs the tribe and he's says they're tired of babysitting. And so then a bunch of grown adults have to explain to Jeff Probst that there's major tension over a empty, licked jar of sugar. Michaela insists she helps around camp, then tells JT to STFU. Aubry explains it's a quality of life issue happening but is abundantly clear how she has to vote. The tribe votes and Michaela pours herself a cup of water, sipping it as the votes are read. Sandra, Varner, and Michaela vote out JT, leaving Aubry stunned by the gameplay that just happened. Then the tribe has a laugh like a sitcom when Sandra admits she ate the sugar.